Replica IDs for system templates like pubnames.ntf and admin4.ntf can cause unpleasant surprises during a Notes/Domino upgrade. SearchDomino.com contributor Andy Pedisich explains how and why you need to change your replica IDs to circumvent potential problems. 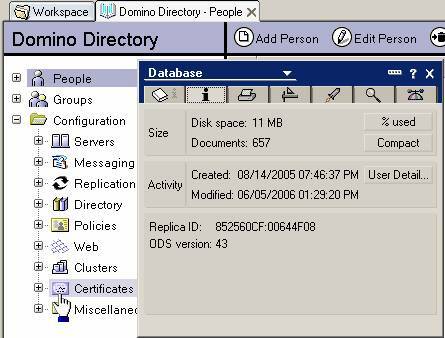 Learn how and why you should change your replica IDs after a Lotus Notes Domino server upgrade with these tips and helpful advice from longtime SearchDomino.com contributor Andy Pedisich. "Whoo hoo, a Notes/Domino new server release! Let's do the upgrade tonight!" That was me when I first started out as a Lotus Notes consultant. I was a real shoot-from-the-hip kind of guy, especially when it came to fixing problems. It's an old story. A Notes/Domino server is getting ready to keel over, and you really want to upgrade it to the newest version because of the fixes it offers. Nothing wrong with that, is there? Who cares if it's the first server to be on Notes/Domino Release 7? We can prevent the design of the name and address book from escaping into the production environment using access control lists (ACLs), right? Wrong! In most cases, upgrading a Lotus Domino server almost guarantees a Notes/Domino name and address book redesign, along with an upgrade of system databases like the Admin4, the Log, and many others. This generally will happen even if you go through the trouble of carefully setting the ACLs of those databases so that the design doesn't replicate. As new Lotus Notes/Domino versions are released, the replica IDs of most of the system templates stay exactly the same as the previous release. They also have the same template names. When you upgrade to a new release of the server, these new templates with the same old replica IDs are placed on the new Lotus Domino server. These templates are then replicated out to every Domino server in your environment. Then, when the design task runs, whammo! All system databases are now at the new Notes/Domino version. Most of the time this is not a terrible issue, since IBM Lotus tries to take great care in making sure all the designs are backward compatible. But to make it even more interesting, the replica IDs of the templates in your domain are exactly the same as the templates in mine. Take a few moments to look at your pubnames.ntf right now. If it has the following template name and replica ID, we're twins! This can make it very interesting when you replicate across domains, or when an administrator or developer who has made test customizations to these templates replicates with production servers Your domain might accidentally pick up unintended customizations! Wouldn't that be an exciting morning? The newest IBM Redpaper about upgrading, "Lotus Notes and Domino 7 Enterprise Upgrade Best Practices" covers this issue quite nicely. I consider this document mandatory reading, even if you are a grizzled old Lotus Notes consultant like me. This Redpaper recommends changing the replica IDs of templates as a way to control the release of the new designs into the environment. I'm 100% behind this idea, and it's something that I have been preaching since I started working with Lotus Notes and Domino back in the Stone Age . IBM recommends two ways of changing the replica IDs. The first way is to make non-replica copies of all of the templates in the new version. That means a File…Database…New Copy of every single template. I've personally done this many times in the past, and I have to tell you it is a tedious, glacially slow, mind-numbing experience that will cause your eyes to glaze over and your head to hit the monitor as you nod off to sleep. The Redbook makes a second recommendation. It says to use a free replica-changing product from the folks at TurtleWeb. This is a nice little freebie of a tool! It works on databases as well as templates. It's very simple, and it changes only one replica ID at a time. And you'll need to provide the new replica ID yourself. Rocky Oliver took the TurtleWeb app a lot further with a Lotus Notes application for changing replica IDs of multiple templates and posted it to OpenNTF.Org. This nice little application will discover all the templates on a Notes/Domino server and let you change replica IDs on as many or as few as you like all at once. When you're getting ready to upgrade, simply install a new server on your laptop or a test machine and make a copy of Surely Template on it. Let it find all the new templates for the new version, and then change all of their replica IDs. Personally, I also customize the ACLs of these new templates, but that's the subject of a different article. Shut down the test server and copy all those templates with their new replica IDs to a new location. I usually copy them to the network location that I use to store server installation kits. After I install a new or upgrade a Lotus Domino server, but before I start it, I delete all the original system templates. I then replace them with these specially prepared ones with replica IDs that are different from any others in the world. This easy-to-do preparation protects my templates from unintended modifications and helps keep me in control of my Notes/Domino universe. Note4 is in the corner now, I want to get one faked Note4, does any one have good recommendation? How about this one?